Write or draw with the included stylus or almost any other instrument - even your finger. The revolutionary LCD featured in the 8.5 inch retains an image indefinitely without power until you press the erase button to clear the screen. You don't need to use an eraser, just press the button, the screen will be clean again. Save much much paper! Save many many trees! Suitable for designers, business man, teacher, students and more. A good helper for students to make note, draft, use for math scientific formula. A warm reminder for leaving messages to your families, lovers. Also a meaningful toy for your kids or toddlers to develop a good habit for drawing, writing... Let imaginations run wild without worrying about the mess from markers. The battery generally will last for 2 years and is easily replaceable. 【High-Tech】More Clear and More bright image can show in the LCD wirting pad. The pressure sensitive screen creates lines of different thickness based on how hard you push - just like paper and pen. 【One Touch Clear】Erase your image with the touch of a button and a friendly flash from the liquid crystal display. Ultra low power consumption battery, will last 50,000 times of erases! 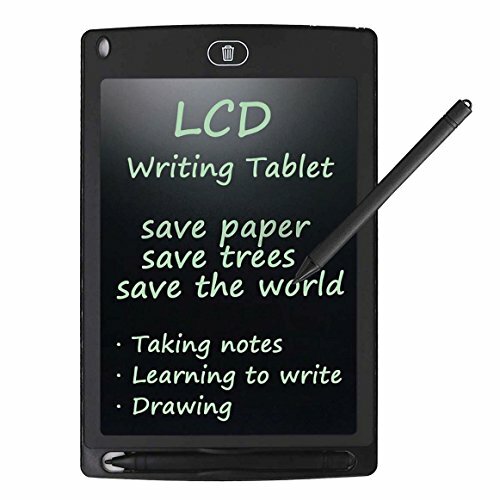 【Environmental Friendly】Write or draw with the included plastic stylus, the LCD writing tablet can be used repeatedly, and you can save 1000 pcs paper every year! It will prevent you from using papers, eraser, pens or pencil ever again. It will be your contribution to preserve the forest! 【Eye-Friendly】The 8.5-inch size is large enough for you to write and is comfortable for eyes. Contain no chemical components, glowing light, no radiation, no glare, all is to protect users' eyesight. 【Portable & Durable】The case and LCD are made from durable plastic materials. 0.19'' ultra thin, making it easy to carry, easy to store in your briefcase, daypack, purse and luggage. Perfect companion for office, daily records, memos, notes, messages, calligraphy exercises, calculations, kids drawings, etc. If you have any questions about this product by Rantizon, contact us by completing and submitting the form below. If you are looking for a specif part number, please include it with your message.